Coral Sea diving, the Cod Hole and diving the Great Barrier Reef has never been better than on this Australia liveaboard dive trip . 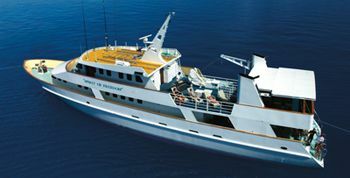 See our full Australia Liveaboard Dive Trips selection here. One of the ocean's great dive adventures is scuba diving in the Coral Sea. This Coral Sea cruise on board MV Spirit of Freedom visits the Ribbon Reefs and the famous Cod Hole. Diving the Coral Sea, however, is much more than this. You will find yourself immersed in an array of sea life that is difficult to comprehend including manta rays, sharks and giant groper. The Coral Sea is unpolluted and the crystal clear waters are filled with marine animals and corals that make it Australia's greatest scuba diving destination. This is the itinerary for the 3 day Coral Sea cruise but also available are the Coral Coral Sea Diving Liveaboard - Prices, Information & Enquiry Form - 4 days and the Coral Sea Liveaboard Trip - Prices, Information & Enquiry Form - 7 days. Monday: Our bus will pick you up from your Cairns hotel around 11:00am to transfer you to Trinity Wharf to board the vessel. You will be greeted by the Spirit of Freedom crew, and receive an orientation of the vessel before departing at noon. Lunch will be served on board while we are cruising to the outer Great Barrier Reef for an afternoon refresher dive followed by a twilight or night dive. After dinner our Coral Sea cruise takes us north to the Ribbon Reefs. Tuesday & Wednesday: You will be diving at the most northern of the Ribbon Reefs, Number 9 & 10 Ribbon Reefs. Weather dictates the best dive sites but will always include at least one dive at the Cod Hole, where you will meet a family of massive and very friendly Potato Cod. Other available sites include Wonder-wall, Pixie Pinnacle, Challenger Bay, Two Towers, Lighthouse Bommie, and the Snake Pit plus many more. If the current is suitable, you may also do a drift dive at Dynamite Pass, well known as a channel where sharks pass through. Four to five dives will be available each day, including a night dive on the Tuesday. On Wednesday evening we will spend the night at Watson's Bay on Lizard Island and enjoy a sunset BBQ dinner on the top deck. Thursday: Today, after breakfast, you will disembark and say farewell to Spirit of Freedom. On shore at Lizard Island you can take the guided walk from Watson's Beach to Mary Watson's cottage over Chinaman's Ridge and back to the air-strip. Here you will board a twin-engine light aircraft for your low level flight over the reef and / or along the coast back to Cairns. The one hour flight arrives at Cairns General Aviation Airport at about 11.15 to 11:30am, where our courtesy coach will meet you for your transfer back to your Cairns city hotel.